Japanese auto major Honda Tuesday unveiled two new models, CB650R and CBR650R in the mid-weight sports bike segment for the European market. The company also unveiled three extensive upgrades for existing CB 500F, CBR 500R and CB 500X models at the EICMA 2018 motor show. "It is 2019 European motorcycle line-up. The introduction of two new and three extensively upgraded models bring new energy to the middleweight area of Honda's uniquely broad and deep product line-up," Honda said in a statement issued here. Model CB650R comes with an in-line four-cylinder engine, signature round headlight and sculpted fuel tank underline the 'Neo Sports Cafe' family. The company plans to launch another model CBR650R with a sportier riding position. The machine comes with in-line four-cylinder engine along with the sculpted looks and honed chassis. "Out of the 5 models showcased today CBR650R will be launched in India in early 2019," Y S Guleria, Senior Vice President, sales and marketing at Honda Motorcycle and Scooter India Pvt (HMSI). 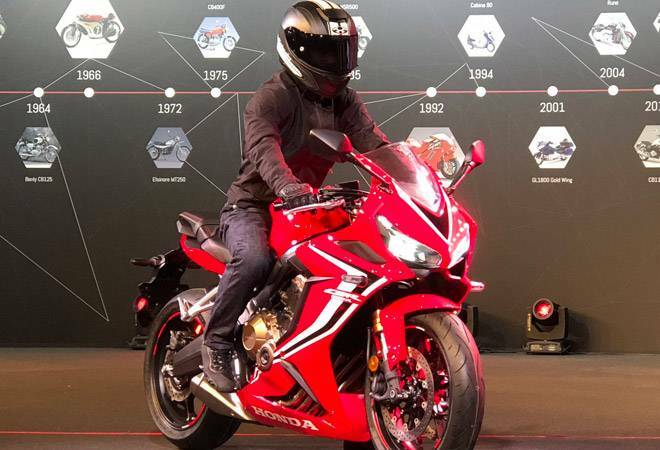 CB500F, CBR500R and CB500X, for 2019, the company said, have an advanced engine, stronger power and torque between three and seven thousand rpm, and powers the light middleweight trio in upgraded packages with higher specifications and stronger roadster, sport and adventure identities.